When your child has a hard time at school, it isn't always a learning disability. He or she might have a hidden but very real vision problem that impacts learning. It's known as Convergence Insufficiency (CI). In short, CI is a near vision issue that gets in the way of a child's capacity to see, read, learn and work at close distances. A sufferer of CI has a hard time, or is entirely not able to coordinate his or her eyes at close range, which makes common activities, like reading, really challenging. To prevent double vision, schoolchildren strain more to make their eyes turn back in, or to use the correct medical term, converge. And this added burden on the system can lead to an astounding amount of uncomfortable side effects like eyestrain, headaches, blurry or double vision, sleepiness, difficulty concentrating, and reduced comprehension after small periods of reading. With the worst instances of CI, the eyes may actually turn outwards, which is known as strabismus. Other things that may point to CI are if your son or daughter often loses the place when reading, squints or tends to shut one eye, has trouble remembering what was read, or tells you that words they look at seem to move around on the page. Another issue that often comes up is motion sickness. Unfortunately, CI is usually misdiagnosed as ADD or ADHD, dyslexia, or an anxiety disorder. And furthermore, this condition slips under the radar during school eye screenings or basic eye exams using only an eye chart. Anyone can have 20/20 eyesight, while having CI, and not have the visual skills we all need for reading. But there's good news too! It's been shown that CI often responds positively to professional treatment. 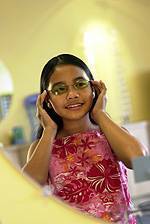 Treatments generally involve supervised vision therapy with practice sessions at home, or the use of prism glasses, which will reduce some symptoms. The unfortunate news is that since there is considerable lack of testing for it, many people are not finding the help they require early in life. So if your child is struggling to read and concentrate, see us to discuss having your child tested for CI.